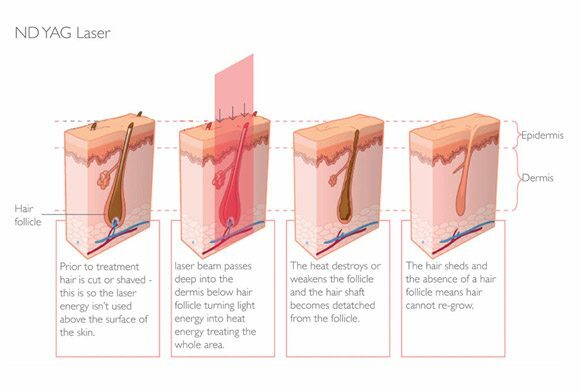 Nd:YAG laser energy is absorbed selectively by the hair bulb and hair matrix, destroying the hair follicle.Laser parameters can be adjusted quickly and easily according to your skin type, hair thickness, hair color as wellas depth of hair follicles. Cooling is applied to maximize comfort during the treatment. Follicles treated in the anagen phase should fall out in approximately 2-3 weeks. Observe if new growth is present and repeat the treatment if needed.